I found these 2 divine images in my files this morning and had to post them. The file says "maison 10" I think I found them on Pink Wallpaper, but I am really not sure. I will find out and attribute correctly. Can you imagine having a living room this beautiful? I adore the rose drapes pooling on the painted floor, and those palladian doors! Oh my! 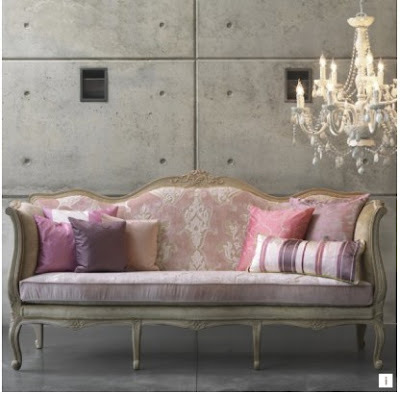 The juxtaposition of the industrial concrete wall and floor and the pink silk upholstered French sofa is to die for! Oh and if anyone has a source for the white chandelier in the image above, I would love it! The images below are of my finds at the St Joseph's Antique Fair on Saturday. 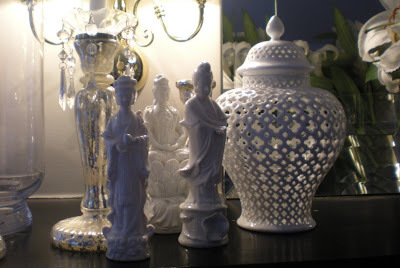 I had such fun fossicking with The Huntress and her mom for nothing in particular and I love my little collection of mismatched white Chinese figurines. 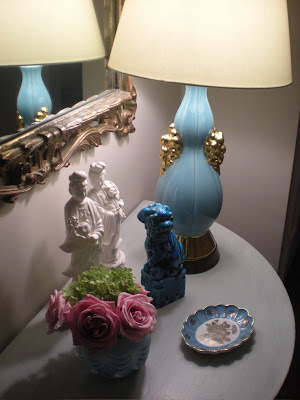 The Huntress and her mom advised me to grab a little "poison", so I purchased my lone blue foo dog. My children say he scares them, so I told them not to look at him. I love him! I was also so lucky to grab these pretty little Japanese prints. The palette is just perfect for my living room. So sweet! LOVE your st. jo's finds, aren't you glad you went back. 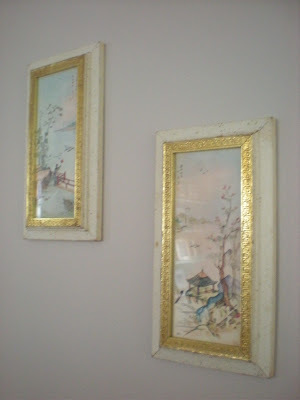 Those darling chinese prints read really well, good find. Do you know where I can find that white chandelier? Beautiful photos!